Learn how to make your kitchen environmentally friendly! 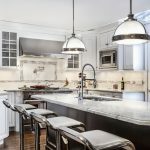 Whether you are designing your kitchen from the ground up or in the midst of a remodel, you want to focus on making it environmentally friendly as possible. Since you will spend a large portion of your time at home in your kitchen, you want to focus on conserving energy and starting green practices. It is good to incorporate sustainable materials into your kitchen design as a start to be eco-friendly. Luckily, there are few simple tips you can follow when trying to design an environmentally friendly kitchen. When it comes to designing an environmentally friendly kitchen, you need to focus on the materials you are using. When designing your countertops, you want to choose a sustainable, low maintenance material. Quartz is one of your best options because it has very little environmental impact during the manufacturing process. It is also a long lasting material that will not crack or chip. An important element of eco-friendly kitchen design is lighting. Depending on where your kitchen is located, you should let in as much natural light in as possible. Taking advantage of natural lighting will decrease your energy bill as well as contributing to the health and wellness of your family. Make sure to install LED light fixtures in your kitchen because they cut the energy use of regular light bulbs up to 50 percent. One of the most important elements of any kitchen design are the appliance because they allow it to be a functional space. When looking for appliances, make sure they are approved by the Environmental Protection Agency’s Energy Star program. Energy Star approved products use up to 50 percent less energy and water compared to standard models. So, pay attention when you are choosing your next refrigerator or dishwasher. This entry was posted on Friday, July 27th, 2018 at 2:05 pm. Both comments and pings are currently closed.